Do you remember Swedish Chef from the Muppets? Casey went to the Center for Puppetry Arts in Atlanta last week with her Godmother. She had a blast! (Although, I was always afraid of the puppets when I went as a kid.) Well, it seems as though Jim Henson's estate donated some of his Muppets to the CPA's museum. Casey "discovered" the Muppets and was fascinated! So, once home, DH and I showed the kids some Muppets clips on YouTube. Casey saw Swedish Chef and went nuts! "That's Swedish Chef! He's at the Puppet Museum!" So, DH and I proceeded to watch EVERY Swedish Chef video we could find on YouTube. Even though they are all basically the same, they were pretty amusing. Especially the theme song! 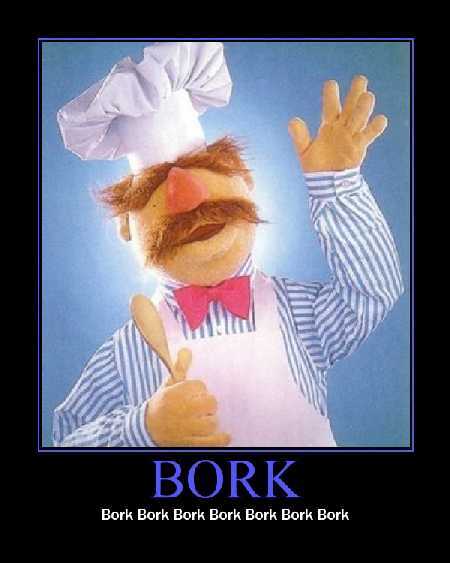 Swedish Chef sings several unintelligible lines, then says, "Bork, bork, bork!" and throws whatever utensil(s) he is holding. DH then found a web filter allowing you to alter the text in your internet browser - or maybe it's only specific to Firefox, my brower o' choice, - to "Swedish Chef." It was amusing... at first... until I couldn't turn it off! I went to Eeee-bay-a and the Weeel-Trained-a Meeend before I begged DH to fix my computer. I've now had my fill of the good Chef. Hey! It's Karen Fray. I just found your blog and the Sweedish Chef is too funny! Sorry you couldnt get it to turn off but that's still pretty funny! I have to start a blog about my kids too. I just don't want to forget all the funny stuff they do and say.